In examining Factor #1, the Court will determine if the conduct was accidental or intentional. If it is proven that a party willfully destroyed relevant evidence, then this factor will help the non-spoliating party. If it is accidental, this factor may benefit the party who destroyed the evidence. Factor #2 concerns how much each party is harmed by their ability/inability to examine the relevant evidence. In Tatham, neither party was able to review the tire in question, so the Court did not weigh this factor heavily to help or hurt Plaintiff or Defendant. If one party was able to view the evidence, then it was destroyed without the other party viewing it, the Court will consider factor #2 in their analysis. Factor #3 is important because opposing parties commonly disagree on when litigation is “reasonably foreseeable” and it may vary from case to case. For instance, if a party is seeking to obtain the video of an injury that occurred at a business and they inform them of this by sending a litigation/legal (https://www.zapproved.com/blog/what-is-a-legal-hold/) hold letter immediately after the accident, then litigation should be considered “reasonably foreseeable” upon their receipt of the legal hold letter. (4) The least severe sanction available to remedy any prejudice caused to the non-spoliating party. Lastly, factor #4 states that the Court should show some restraint in sanctioning any party for destroying/spoliating evidence. How might the Court punish a party who destroys evidence? The court will examine each scenario on a case by case basis using all four (4) factors listed above before sanctioning any party for destroying evidence. The Trial Court may choose to impose sanctions under Rule 37 of the Tennessee Rules of Civil Procedure. The Court has a wide discretion of sanctions that they may Order which range from an adverse inference (https://definitions.uslegal.com/a/adverse-inference-rule/) all the way to a Default Judgment. A Default Judgment is normally reserved for the most severe behavior. You are preparing for a divorce in Williamson County, TN, and you are worried your spouse may destroy relevant evidence concerning inappropriate marital conduct and/or dissipate marital assets. You have been the victim of racial discrimination or sexual harassment and all relevant emails/information are on the company’s private internet server. You have been injured on a third party’s property and you need to obtain the relevant video evidence that is solely in the third party’s possession, custody and control. 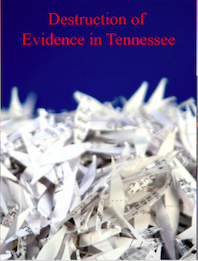 These scenarios demonstrate the importance of preserving important evidence and retaining skilled and competent counsel for various legal disputes in Tennessee. The Cole Law Group litigation attorneys in Nashville can help to ensure that important evidence is preserved prior to prosecuting or defending parties in diverse types of litigation.